Find out why this brand new entry from SkinCeuticals is making headway with skin care. As we approach winter and especially for those that suffer from dry skin the newly released SkinCeuticals product Triple Lipid Restore 2:4:2 is a must have. As a leader in skin health and research SkinCeuticals is committed to developing skincare products backed by science that provide corrective benefits while promoting overall skin health. The latest addition to their advanced portfolio Triple Lipid Restore 2:4:2 is the result of the brand’s groundbreaking research in Lipidomics, an emerging field studying lipids and their role in skin health. 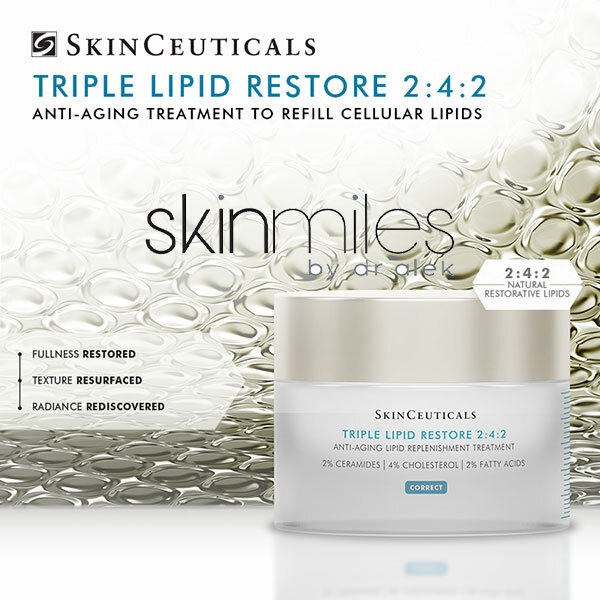 Triple Lipid Restore 2:4:2 refills cellular lipids to support natural skin repair and nourishment. This anti-aging treatment restores fullness, resurfaces texture, and rediscovers radiance. Lipids are essential components of skin and play a crucial role in the skin’s barrier function and important role in cell-to-cell signaling. Triple Lipid Restore 2:4:2 is formulated with a maximized concentration of reparative lipids: 2% pure ceramides, 4% natural cholesterol, and 2% fatty acids. This anti-aging lipid correction treatment contains the first cholesterol-dominant ratio to refill lipids, restore skin’s external barrier, and support natural repair, while potently nourishing aging skin. Triple Lipid Restore 2:4:2 has been clinically proven to improve skin’s smoothness, laxity, pore appearance, and overall radiance. Contact Dermatitis. 2008 May; 58(5):255-62. doi: 10.1111/j.1600-0536.2008.01320.x. Lipids and skin barrier function–a clinical perspective. Jungersted JM1, Hellgren LI, Jemec GB, Agner T.